One of the many things I've been busy with the last few months is special orders. The timing has worked out quite nicely. It seemed like just as I was finishing one order, someone else would message me a request. I only had to turn a couple of people down when it got too close to Christmas to finish their items in time. Unfortunately, I wasn't able to get really great pictures. Most of the stuff I make is much smaller than this, so my normal photo equipment wouldn't work. I think that you can still see from the pictures how beautifully they turned out. I was very pleased with the final stockings. It was also great to find that perfect red yarn. Last year I found some that was this color, but it was more expensive and not as thick. I'd been thinking about trying to dye some of the cream, but hadn't tried it yet. Even though this red yarn is a different type and brand than the cream, it is so similar that I was able to use them together. I've already started making some more stockings for next year. I'm excited about some new color and style options that I will have available. I've also got some matching ornaments in the works. It's never too early to start planning for next year, right? Hi! 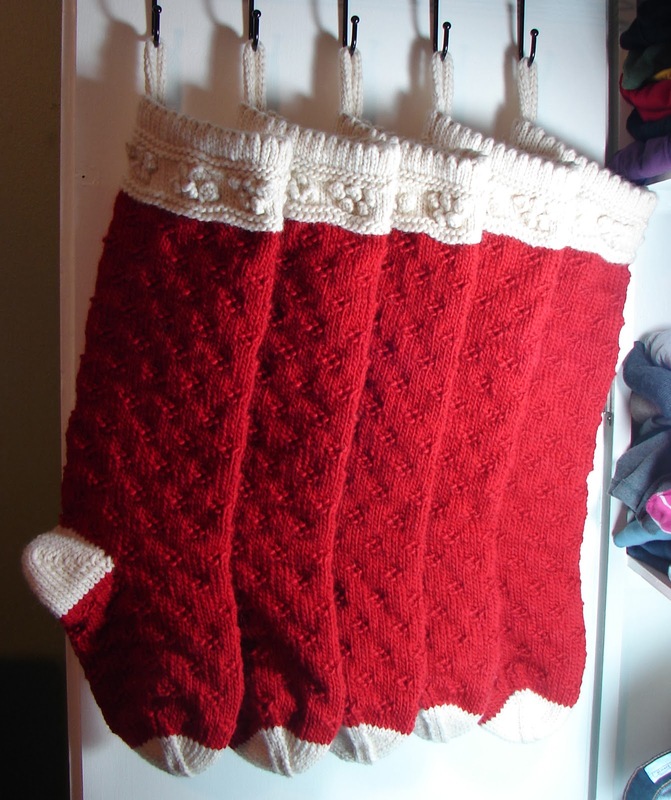 I just came upon this post with a knit stocking search and I love the pattern. Do you sell the pattern itself? Hello! Yes, I do have the pattern for the stocking. I made a few adjustments from the pattern for the stockings in this post, though. I used a different yarn for the body of the stocking and made the heel and toe white. I also made it a bit longer than the one in the pattern.